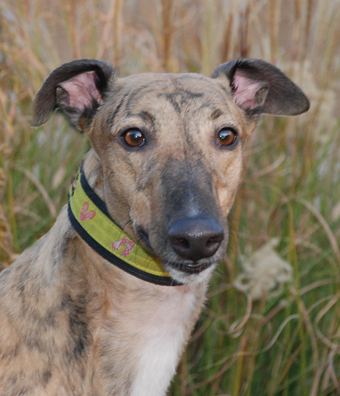 Ruthie is a sweet, friendly girl that wags like crazy when she meets people. She has been doing quite well with the transition to pet life. She loves attention and everyone is her friend. This outgoing girl is very inquisitive and checks out everything and nothing seems to scare her or bother her. Ruthie passed her cat and small dog test at the track but has show some initial interest in some cats she has met so will need a careful introduction and supervision around cats at first. She seems to lose interest in them pretty quickly. She just needs to know what they are. She seems like a great all around dog that will enjoy doing just about anything that her family wants to do. She still needs a little work on walking on leash without pulling but once she picks that up she would be nearly perfect. This is a fun playful girl!